A young "genius" prosecutor who has been carrying on work in Germany. Franziska was raised by her father, Manfred von Karma, and began her career as a prosecutor in Germany at the young age of 13. She is considered a genius in her field and, up until her appearance, never lost a case. Franziska is much like her father - striving for perfection. Always curt and precise, but she displays more smugness (and frustration) than Karma. She also goes to extreme lengths to preserve her record. Despite speaking formally most of the time, she sometimes breaks out into petty and redundant insults, mostly involving "fool". Example: "Only a foolish fool from a land of fools could think something so foolishly foolish." 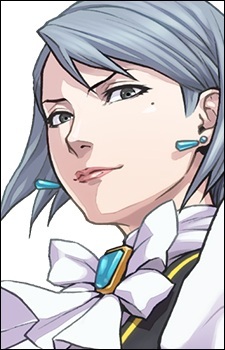 Franziska is Manfred von Karma's daughter, and was raised along with Miles (she thinks of him as her "little brother"). She also has an older sister who is married and has a daughter. "Franziska" was probably chosen to match the German influence of her father's name. The kanji for "mei" means "dark." When the game came out there was some confusion as to whether she was Karma's daughter or niece, because the word mei means niece. In the Japanese version, she was practicing law in America instead of Germany.